Weight: buck 100-200+ lbs;doe 80-160 lbs. Male deer, called bucks, will mate with several female deer. Female deer, called does, may mate with one or more males. Mating occurs in autumn, and females breed every year. After a gestation period of 196 days, 1-3 fawns are typically born in May or June and weaned at 4 months. Fawns will stay with the doe for the first year, then yearling bucks leave. Yearling does may stay and form family units. Some does breed as fawns, although most begin breeding at 1.5 years-of-age. In the wild, 2-5 years for bucks and 3-6 years for does in the wild. Age is determined by examining teeth in the lower jaw bone. In the United States, white-tailed deer are found in all 48 contiguous states. 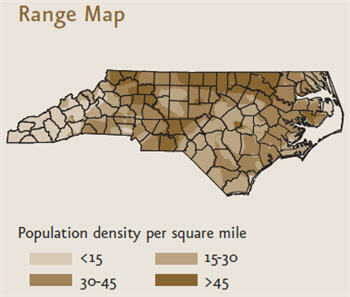 Every county in North Carolina has deer, although they are distributed unevenly, with large numbers in some areas of the Coastal Plain and Piedmont and fewer deer in the Mountain Region. The five species of deer in North America are: the mule deer, white-tailed deer, elk, caribou and moose. 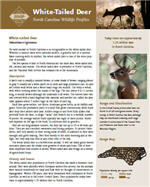 The white-tailed deer is prevalent in North Carolina, and the National Park Service has released elk in the mountains. Buck deer grow antlers, not horns. Antelopes grow horns, as do buffalo and goats. Horns are permanent parts of a skull that grow continuously, while buck deer drop their antlers each year. Antlers range in size from little spikes that protrude from the skin, to larger “racks” that branch out to a variable number of points. 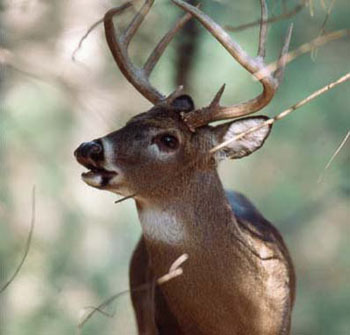 An average mature buck typically has eight or more points. Antler size depends on the age of the buck, its nutrition, and its genetics. While deer can run up to 35 or 40 miles per hour, they cannot run 35+ miles per hour for very long. They are also excellent swimmers and strong jumpers. To protect themselves, deer rely mainly on their strong sense of smell. They also have good hearing, as well as eyesight that enables them to easily detect movement, even in low-light conditions. 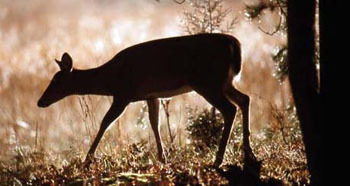 Deer feed mostly in the early morning and at twilight, but they may also feed at any other time of the day. The white-tailed deer population in North Carolina has made a dramatic turnaround. Deer were plentiful when European settlers first arrived, but the animals were hunted extensively for meat and hide with no thought of conservation or management. Within 100 years, deer were threatened with extirpation in North Carolina, as well as in the entire United States. 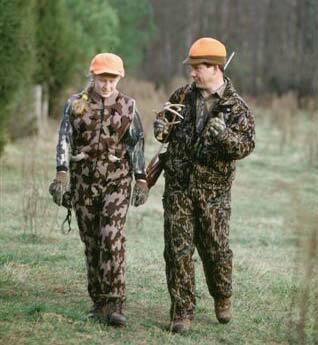 Deer populations today have risen to approximately one million deer in North Carolina. White-tailed deer are often seen feeding in fields, on the side of the road, and are becoming increasingly common in residential areas. When properly managed, hunting does not hurt deer populations and is a helpful management tool for keeping deer from becoming overpopulated. Before European settlers arrived, deer populations were controlled by year-round hunting by Native Americans and large predators like cougars and wolves. Without some control, deer populations grow larger than their habitat can support, causing mass starvation and disease in deer herds, as well as severe crop depredation and overgrazing of habitat. The N.C. Wildlife Resources Commission is imploring people not to approach, touch, feed or move white-tailed fawns. Though the tiny baby deer may look very much alone, most likely they are not abandoned. If a fawn is in obvious danger, contact the N.C. Wildlife Resources Commission at (919) 707-0040 for the telephone number of a local, permitted fawn rehabilitator. It is illegal to remove a fawn from the wild. Written by Chris Hartigan, Scott Osborne, Jonathan Shaw, and Evin Stanford, NCWRC; updated 2017. Illustrated by J. T. Newman. Photos by NCWRC. "White-Tailed Deer, Odocoileus virginianus" National Geographic. http://animals.nationalgeographic.com/animals/mammals/white-tailed-deer/ (accessed February 4, 2013). Elman, R. 1976. All about deer hunting in America. Winchester Press. Hewitt, D. 2011. Biology and management of white-tailed deer. CRC Press. Madson, J. The white-tailed deer. Olin Matheson Chemical Corporation. Osborne, S. The white-tailed deer in North Carolina. N.C. Wildlife Resources Commission. Rue, L. L. III. 1978. The deer of North America. Grolier Book Clubs, Inc., Outdoor Life. I am not a Dr Deer but white-tail range from very small to very large depending on their location and how harsh the winters are. Very cold temps animals have to be a lot bigger to make. It could be that in your area that it is a very warm climate and not enough food to handle large bodied animals. Nature has a way of making sure that the animals in some areas are not bigger than the amount of food the area will produce. So the amount of food they eat is a lot less and their size is reduced. Hi, I am doing a school project involving researching white tailed deer in North Carolina and comparing them to deer in the Czech Republic. I am wondering what methods were used to gather the data on the population size and the deer's average sizes? Thank you! Thanks for visiting NCpedia and sharing your project and question. That's a great question! I hope this helps and best of luck with your project! Let us know if you need additional help. I live in an equestrian development that is thinking about culling deer. Since I live in the country. would other deer likely move in after the cull? What sort of information were you looking for that you did not find in the article? You have the "Length/height as 3 feet"....that should be corrected. Also, I wondered if anyone ever reported the tiny deer I have seen in Vance County. Before I got the yard fenced (and a dog), I had a herd of extra small deer come into the yard every year in late winter. The tallest only as tall as my well house (about 2.5 ft.) and they are darker and black on the back and tail. They stick together and do not associate with the white-tail deer which also come near my yard. The WTD are about 4 ft tall and 4 or more feet in length. The difference is very noticeable--I know, I questioned myself for a couple of years that I was seeing smaller WTD. But they are definitely different deer. I called a wildlife officer in FL to see if there was a chance Key deer could migrate this far north...he said no. I hardly see any deer now---too many coyotes I think they are taking all the game from my area. We have checked with the deer biologists at the NC Wildlife Resources Commission and they confirm that this size average has actually stayed the same.